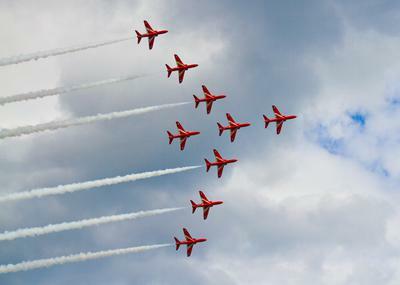 The Red Arrows are showcasing their 2013 display demonstrating the power and versatility of their jet aircraft and the professionalism and courage of the pilots. Spectators got a moment by moment explanation of what was happening in the skies from the Flight Director and Display Commentator, Jeff Salter and Angelo Cunningham respectively and of course red 10, Squadron Leader Mike Ling was also commentating on the red Arrow display. This is one of my best shots of the day. 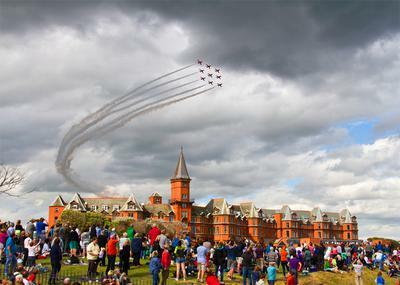 I was lucky enough to get a shot of the Red Arrows as they flew over the Slieve Donard Hotel. 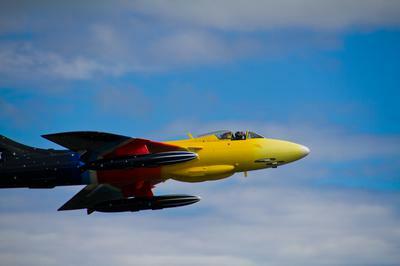 Jonathon bought the aircraft in 1996 and the plane is sponsored by PRC De SOTO and Aim Aviation (Jecco) Ltd. The F86 was made famous in the Korean war. 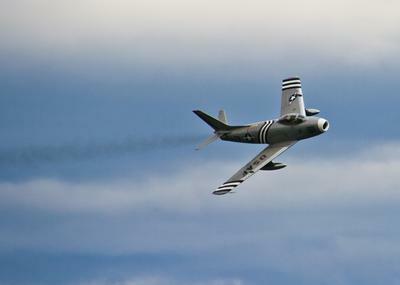 This particular F-86A flies in markings of the 4th Fighter Interceptor Wing in Korea. It was rescued from a reclamation center and restored in the early 1970s by former Mustang pilot Ben Hall of Seattle.